Braided fishing line, also known to most as “braid” has been steadily gaining ground in the fishing world for the past decade. Braided lines have very little stretch and have extreme strength to diameter ratios when compared to monofilament or fluorocarbon lines. These features make braid an ideal line for long casts, reaching previously unheard of depths and feeling soft bites. Our braid has been designed to be an all around performance braid, with excellent casting, delightful handling, and pure toughness. + What & How Much Braid Do You Need? Register your reels with us so that we can help recommend you lines, or try our braided backing and mono topshot calculators to do it yourself. We are ready to help you spend more time on the water with our brand direct braided fishing lines delivered directly to your doorstep. + Why Is Braided Fishing Line Awesome? 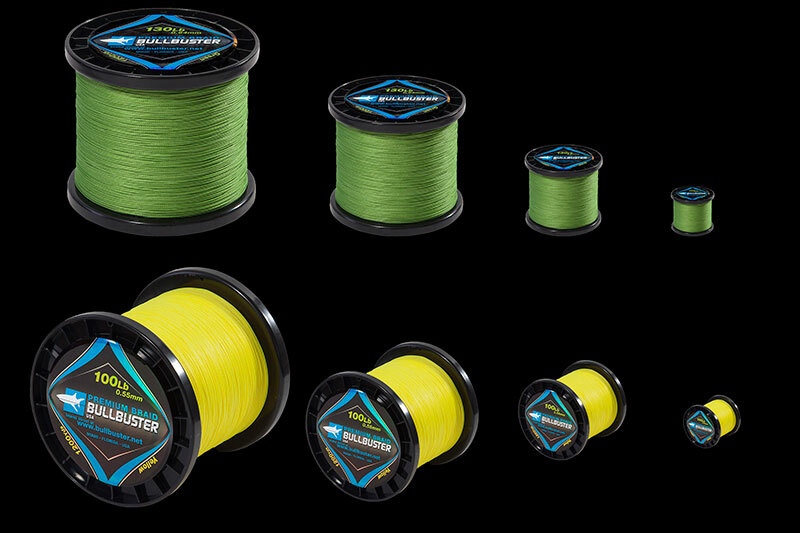 Our braid is a fraction of the diameter of monofilament or fluorocarbon which allows you to pack amazing quantities of heavy line on small reels. Because of this braid has revolutionized big game fishing with light tackle. Anglers are constantly landing bigger and bigger fish with lighter and lighter tackle. Because it is so thin, it easily cuts through the water and can help you reach great depths. Whereas deep dropping was traditionally done with heavy reels full of monel steel, one can now reach the bottom faster and with less weight. Our braid has virtually no stretch. This means it has the sensitivity you need when trying to feel elusive bites. This is great for the soft thump of a a snook, or the distant thrashings of a daytime swordfish. Braid, especially when used for backing can last for a long time! When compared to mono or fluoro, braid has a lot less wear and tear. This is because it stretches less and is not subject to weathering fom sunlight. + How Do People Use Our Braid? People who like to jig usually fill their whole reels with braid. Braids thin diameter helps your jig reach the bottom with lightning speed. It also allows you feel subtle bites on your way down. Whether you are fishing an electric reel or a big manual reel, you need braid for deep dropping. There is no other way to avoid big U’s in your line when dropping your baits deeper than 400 feet. Braid will help you get down there, and braid will help you . Many bass fishermen exclusively use braid for punching grass. Braids thin diameter and extreme strength can be very useful and punching your lure through the grass. If your lure gets stuck, give it a good yank and get back to fishing! The bass fishermen we talked to usually use between 50 and 80Lb braid to tear big bass out of thick grass. Our braid is perfect for sight casting because it gets less wind knots then almost any comparable braid. Who wants to see a school of daisy chaining tarpon, or tailing bonefish and loose out your shot to a friecking wind knot? We don’t! If you are like us and you have some rods that you use for pretty much anything that comes your way. Braid is probably the way to go. Yea it is more expensive than mono but you really can’t beat it when it comes to castability, durability, your ability to pack tons of yards on a tiny reel. + When Is Braid Not Your Best Bet? + Are You Fishing Around Jagged Structure? If you are fishing around jagged structure braid is not your best bet unless you are using a significant mono topshot. While braid is insaneley sharp, its thin diameter does not play well together with sharp stuff. Always use a leader when using braid, its pretty apparent when you see it in the water that braid is not translucent.